Sentra PKL Wiyung is a place where the culinary street vendors around Wiyung gathered together, where visitors can enjoy variety of available menu. In the absence of adequate design brand, not all people know about the existence of Sentra PKL Wiyung. The objective of redesigning Sentra PKL Wiyungs brand is to attract customers to the Sentra PKL Wiyung and be known in terms of design and comfort. The visual appearance is the important part for a brand. In terms of visuals, this rebranding design using manual techniques for sketching and using digital techniques for coloring. For the future, by doing this rebranding Sentra PKL Wiyung can have a good branding and promoting in more efficient way so that Sentra PKL Wiyung can be known by the people who live in Surabaya, especially by the people who live in Wiyung. 1. Wibowo, Tri. 2002. Teori warna untuk desainer. 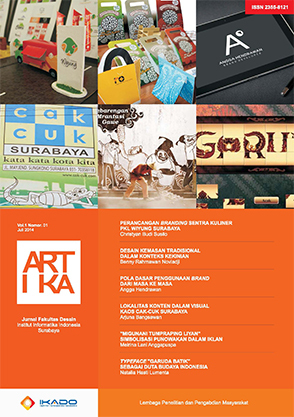 T desain!Hidup berkualitas tak sekedar kuantitas, (online), (www.triwibowo.com/teori-warna-untuk-desainer-2, diakses 10 Juli 2013). 2. Selame, Elinor. 1988. The company image. Jakarta: John Wiley and Sons Inc.
3. Kasali, Rhenald. 1994. Manajemen public relations konsep dan aplikasinya. Jakarta : Pustaka Utama Grafiti. 4. Gregory,James R. 1999. Marketing corporate image.Jakarta :McGraw Hill Professional. 5. Anggoro, M. Linggar. 2005. Teori dan profesi kehumasan serta aplikasinya. Jakarta : Bumi Aksara. 6. Sutojo, Siswanto. 2004. Membangun citra perusahaan. Jakarta : Damar Mulia Pustaka. 7. Rustan, Srianto. 1999. Mendesain logo. Jakarta : PT Gramedia Pustaka Utama. 8. Yustitia. 2013. Manisnya yogya manisnya gudeg wijilan. Wisata Kuliner, (online). (www.kuliner.panduanwisata.com, diakses 10 juli 2013). 9. Wheeler, Alina. 2009. Designing brand identity.Jakarta :John Wiley and Sons Inc.
10. Landa,Robin. 2006. Designing brand experiences. Jakarta : Cengage Learning.